With this multipurpose tool you can drill, cut, sharpen, engrave, grind, carve wood, polish, trim, etch, mill, etc. 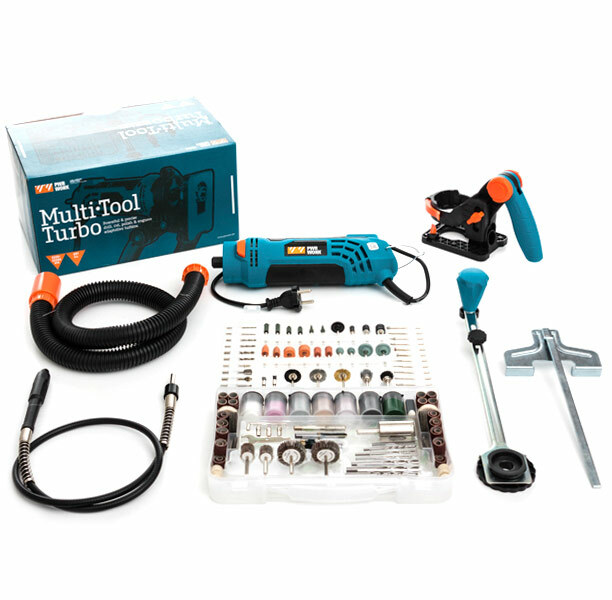 The set includes: 1 Pwr Work® Multi·Tool Turbo™, 1 multipurpose support with handle, 1 guide for circular cuts, 1 revolving hose for accessories (for accurate and detailed works, and for difficult to access places), 1 suction hose, and 1 case with 11 cutting edges and 276 revolving accessories. With this tool you can work on various materials, such as aluminium sheets, wood panelling, plastic, plywood, wooden floors, gypsum and plasterboard panels and much more. 600 W motor and speed adjustment (from 5000 to 25000 rpm).